University of Chicago Press, 9780226299976, 320pp. Peter Ginna was most recently publisher and editorial director at Bloomsbury Press; before that he held editorial positions at Oxford University Press, Crown Publishers, St. Martin’s Press, and Persea Books. He has taught editing in New York University’s publishing program, and comments on editing, books, and publishing at the blog Doctor Syntax and on Twitter at @DoctorSyntax. 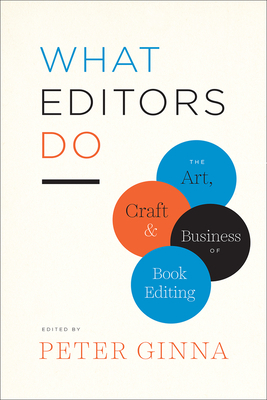 "These honest and unflinching accounts from publishing insiders are a valuable primer on the field at a time where the value of editors and publishers has been increasingly questioned."